There will be a footpath diversion here when building work starts: the original Order is cancelled and is being remade. The Proposed Site Plan to which the Order refers can be found under the Documents list of the planning application. 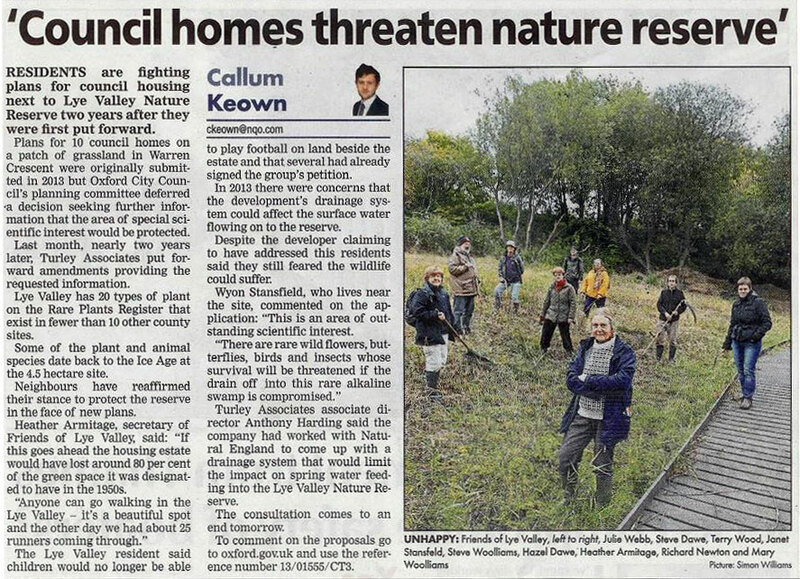 Our thanks to Cllrs Fooks and Wolff for supporting the FOLV concerns about this development and its effects on the Lye Valley SSSI, the hydrology and geology of the area, and the families of Town Furze estate. A new requirement of ‘Monitoring’ has been added to the Conditions. Warren Meadow is the greenfield space directly above the Lye Valley. It is the rainwater catchment and infiltration area for the best spring which feeds the Lye Valley SSSI fen with nutrient-poor, calcium-rich water crucial to the plants and invertebrates which have survived there for the past 8,000 years. It is also the treasured informal play and kickabout area for local children. FOLV had hoped to enhance its biodiversity and encourage its educational use by local children and students. 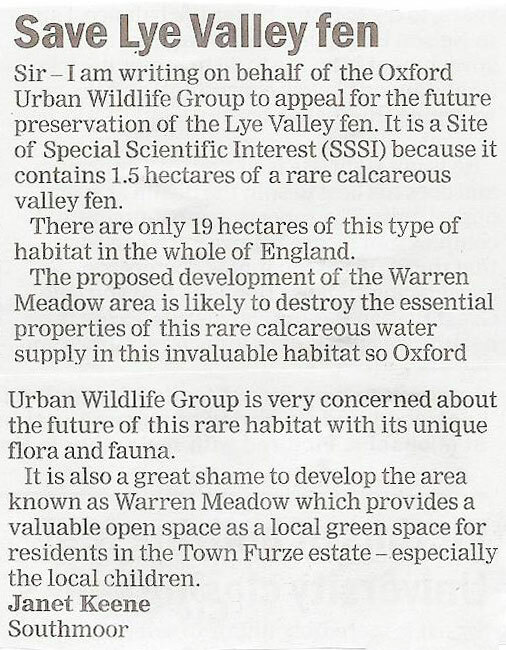 Friends of Lye Valley launched a petition to save the green space (Warren Meadow) which lies directly above the Lye Valley fen, from development. 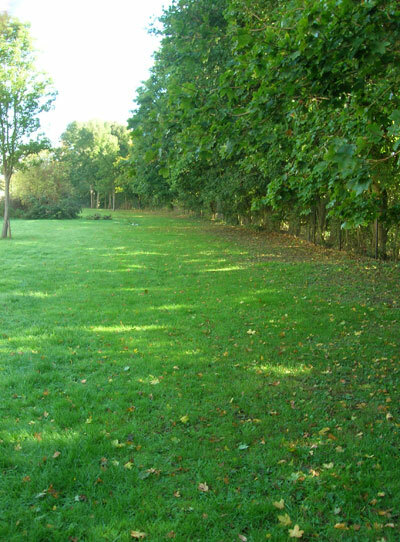 The beautiful grassy area, besides being the local football and picnic area, is the crucial rainwater catchment and infiltration area for the Lye Valley SSSI fen. Development here will have a devastating effect on the fen, inflicting damage which can never be rectified. This planning application was discussed by the East Area Planning Committee on Wednesday 4 September 2013. Several members of FoLV spoke in opposition to the development. After discussion the decision was deferred to a future meeting pending further information on a number of issues, mainly information on the mitigation Sustainable Urban Drainage Systems (SUDS) proposal and the width of the access for deliveries to Town Furze allotments. “The Catchment of the Lye Valley North Fen” about the importance of the catchment in development decisions. What happens when you develop just above an Ice Age fen? This story ‘The Mammoth of Hogley Bog’ explains – and it’s all true – apart from the mammoth. This application for ten houses removes a green informal recreation area for local children and it removes an essential green buffer to the SSSI areas. It threatens the wildlife of the Lye Valley fens because the green area adjacent to Warren Crescent is in the catchment of the springs which feed the wetland SSSI and LWS fens immediately adjacent. Building and paving over this area would prevent rainwater entering the soil and percolating down so that it can feed the springs. Potentially the springs may produce less water and the wetland become drier, with loss of species. However the application has a mitigation plan (SUDS) to infiltrate water into the soil to overcome this problem. This has pipes to catch all the water from roofs and permeable paved areas and pipe it to a long thin shallow pond called a swale in the remaining green part of the site. After a rainstorm the swale would fill up with water and then slowly drain down over a couple of days, so the water gets into the soil to feed the springs. This looks good in theory as a design on paper, but will only work long-term (for ever, which is what is needed) if the whole interception and shallow swale system is de-silted every year and the system is protected from oil and petrol pollution from vehicles. Its proposed position is right under a row of large trees so it will quickly fill with leaves. It will need to be fenced off from people and dogs to prevent dumping and compaction of the swale base. De-silting of this and the permeable paving, removing leaves and vegetation and pollution protection will be expensive procedures which will need to be done annually at some cost. Will there be enough money? Will the work be done frequently enough, to a high enough standard? The occupants of the houses will have to be prevented from paving over their green back gardens to make sure they stay permeable — how will this happen? There is not enough information in the application to be sure that this mitigation will actually work for ever to protect the fens, therefore the housing should not happen, it is too risky. The fens have already been seriously damaged by surrounding urban development, enough is enough.